I've combined two 4 of my favourite things in the recipe. Oats, protein, white chocolate & raspberries. But I've left out the usual butter, sugar and syrup you'd usually find in traditional flapjacks. 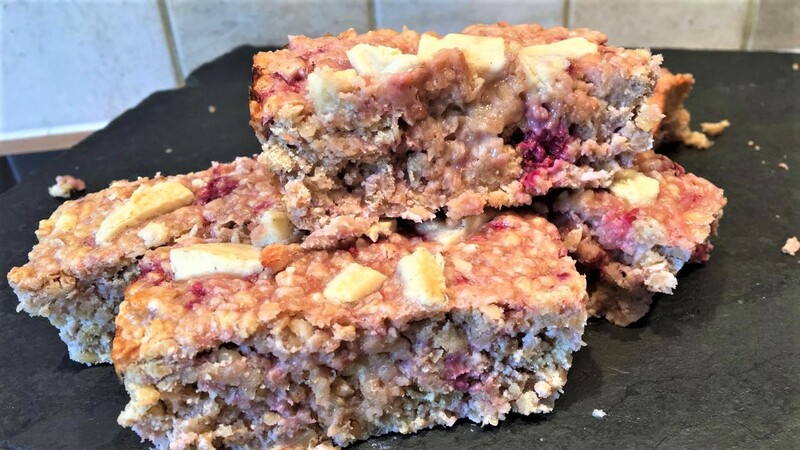 Instead I've sweetened them with Bodybuilding Warehouse White Chocolate & Raspberry Whey Protein which is SO good & also chunks of their new Warrior Crunch bars which take them to another level! Don't worry if you don't have these, you can sub the bars for white chocolate chips, however I urge you to try them, some of the best protein bars I've ever had (and I've tried ALOT!). 1Mix together the porridge oats, ground oats and whey protein. 2In a seperate bowl add the PB and coconut oil, then microwave for 1 minute until they are melted together. 3Pour the melted coconut oil and PB over the dry mixture and mix well. 4Leave this mixture to cool whilst you chop up the protein bar into small chunks. 5Once the oat mixture has cooled add the chopped protein bar (or white chocolate chunks) and raspberries and mix together. 6Finally add a splash of milk to bring the mixture together. Add it little by little as you only want enough to hold the mixture together. 9Allow to cool fully before removing from the tray, slicing & eating!